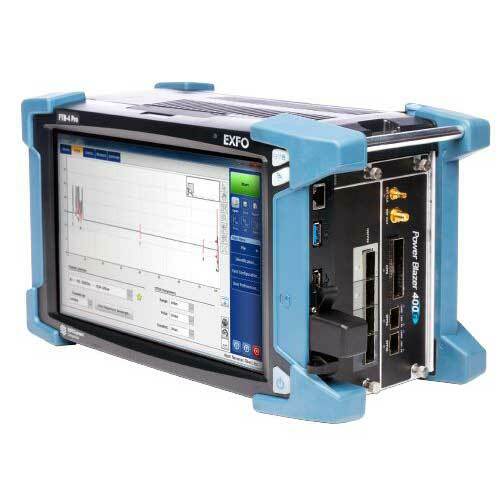 The MAX-940 Fibre Certifier OLTS is the first tablet-inspired solution that has been specifically designed to certify fibre cabling in data centers and enterprise networks. Its intuitive Windows-like user interface ensures a minimal learning curve. 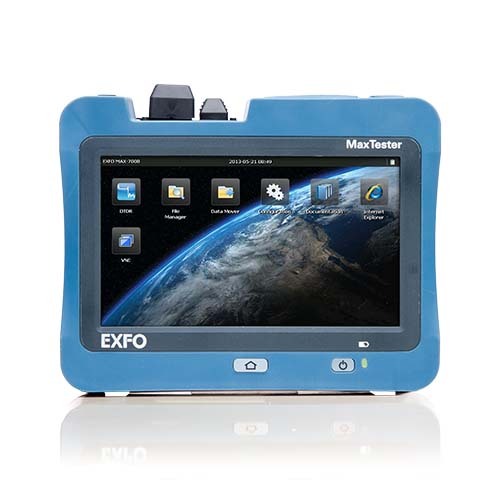 The MAX-940 Fibre Certifier offers icon-based functions, instant boot-up, as well as on-board assistance and on-board professional reporting.With the most user-friendly display in the industry (7-inch, high-resolution touchscreen), the MAX-940 Fibre Certifier delivers unprecedented user experience. 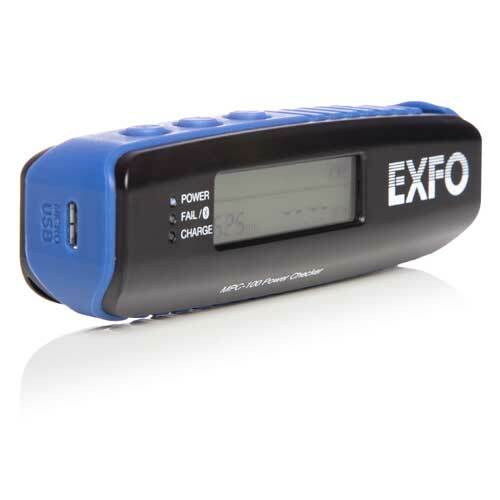 Its integrated Wi-Fi/Bluetooth allows for high connectivity.The MAX-940 Fibre Certifier guarantees a full day of fieldwork with 12 hours of battery autonomy and internal memory capacity for over 150,000 test results. Ever since its introduction in 1996, the patented FasTesT™ technology revolutionized the industry by fully automating the test sequence, saving countless hours of testing and troubleshooting in the field. 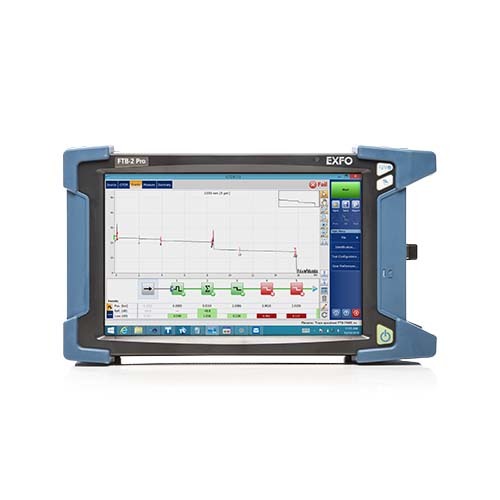 Proven in thousands of diverse network deployments across the globe, FasTesT™ truly enables CAPEX/OPEX savings.The MaxTester 945 (MAX945) boasts a 7-inch touchscreen, the largest and most user-friendly display in the industry to simplify tasks for the technician. 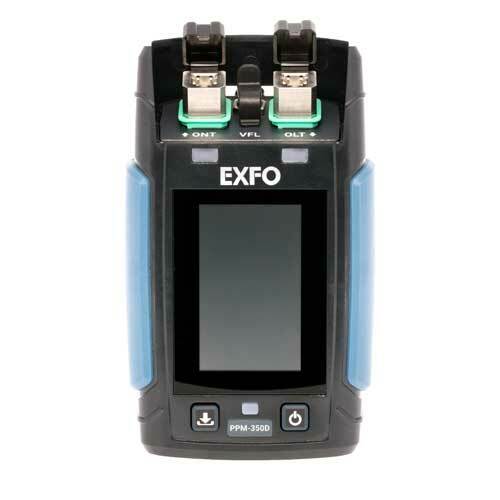 The MAX945 also allows for 100 % automated fibre inspection at both ends of the fibre link. Paired with the FIP-400B automated fibre inspection probes and powered by FasTesT™, this OLTS brings the latest and the best in innovation and automation at your fingertips. Testing MPO and MTP connectorized links can be tricky when using legacy processes and equipment, that’s why we’ve come up with a versatile, scalable and automated solution to meet today’s network challenges. Faster-than-ever testing Automate test sequences with a push of a button thanks to the intelligent multifiber algorithm (iMF) feature. 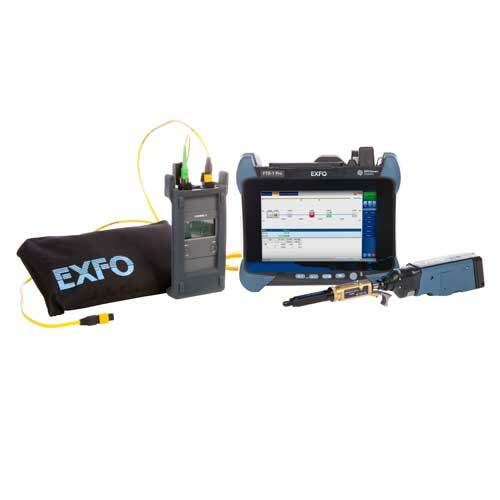 Versatile solution Test, certify, and troubleshoot single-fiber and multifiber with the same equipment set. To provide the right speeds to the right customers, communications service providers (CSPs) are deploying next-gen and legacy passive optical network (PON) technologies by overlaying multiple new wavelengths on existing fibers. This brings new challenges for quick and accurate testing during the critical service activation phase: CSPs need power meters capable of testing next-gen and legacy PON technologies, and their field teams need to be sure they are correctly testing the right technology. The PPM-350D was designed to tackle both challenges head-on with its unique PON-aware™ technology. Developed in partnership with a Tier 1 CSP, the PPM-350D PON Power Meter automatically detects and adapts test parameters for the PON technology in use at the customer premises, eliminating costly guesswork by field technicians. As a result, service providers can deploy faster, cut activation costs and boost customer satisfaction. The MPC-100 is an innovative optical power checker enabling smart device connectivity via Bluetooth®. Paired with the FIP-425B or FIP-435B Wi-Fi inspection probes, this easy-to-use power checker lets you take full advantage of smart device connectivity. You can manage all your results in one place and lower the cost of ownership by utilizing your smart device to its full potential. Scalable, open platform: multipurpose solution ready to evolve as your network transforms with active assurance (L3–L7) and active testing capabilities including an extensive catalog of 140 tests. Simple to use, pocket-sized solution: quickly and accurately tests full line rate Gigabit Ethernet speeds. 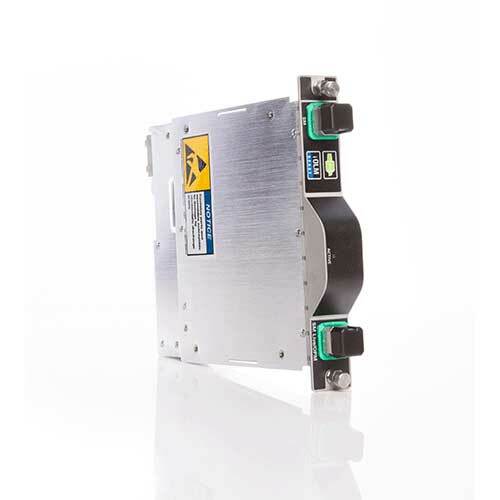 Carrier-grade quality: dedicated FPGA-powered hardware in a rugged, battery-operated solution with repeatable and extremely reliable test metrics. 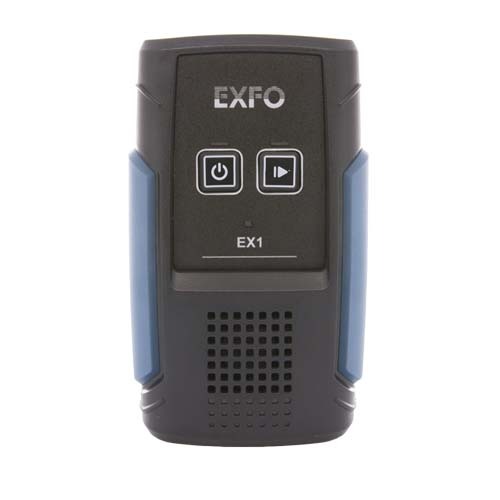 Untethered testing experience: technicians get extended battery life and escape the confines of harsh testing environments by connecting to their Android device using Bluetooth® low energy technology. Efficient job close-out: automated report generation (PDF or CSV files uploaded by email or shared using EXFO Connect client service). 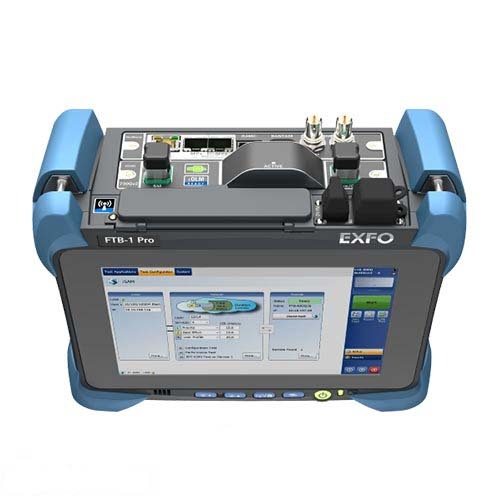 Ideal companion for your activation tool kit: combine with an optical power meter, fiber inspection probe (FIP) or copper/DSL tester to cover turn up of all essential FTTx or business services. 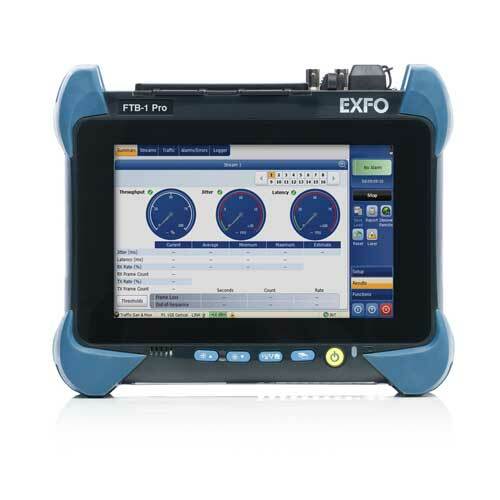 Complete and agile testing of 10G services From development in the lab to troubleshooting in the field, EXFO’s FTBx-8870/8880 Power Blazer features a full suite of test capabilities with a range of technologies up to 10G. Key DSn/PDH and SONET/SDH Preconfigure user-defined bit-error-rate (BER) thresholds prior to running tests. Results are easy to interpret thanks to a simple pass/fail verdict at the conclusion of tests. 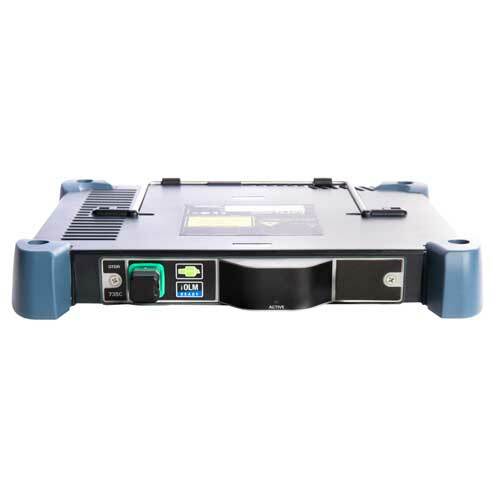 Key Ethernet features Intelligent network discovery mode enables you to single-handedly scan the network and connect to any available EXFO datacom remote tester, with no need for an additional technician at the far-end to relay information. Smart Loopback functionality offers five distinct loopback modes adjusting to all unique loopback situations. Dual-port testing makes it possible for a single technician to launch EtherSAM or RFC 2544 tests using a single module and to obtain bidirectional results. Support for virtual-local-area-network (VLAN) tags, Q-in-Q VLAN tags and multiprotocol label switching (MPLS) to enhance security, scalability, reliability and performance. EtherSAM: the new standard in Ethernet testing EXFO’s EtherSAM test suite—based on the ITU-T Y.1564 Ethernet service activation methodology—provides comprehensive field testing for mobile backhaul and commercial services, including critical service-level agreement (SLA) criteria such as packet jitter and quality-of-service (QoS) measurements. EtherSam bidirectional results Key SLA parameters are measured independently in each test direction, providing 100% first-time-right service activation—the highest level of confidence in service testing. EtherSAM service configuration test Sequential testing of each service to validate that it is properly provisioned and that all specific key performance indicators (KPIs) or SLA parameters have been met. EtherSAM service performance test Once the configuration of each individual service has been validated, the service performance test simultaneously validates the quality of all the services over time. EtherSAM bidirectional results Executes the complete ITU-T Y.1564 test with bidirectional measurements. Key SLA parameters are measured independently in each test direction for 100% first-time-right service activation. iSAM: simplified Y.1564 (EtherSAM) and RFC 6349 testing With iSAM, the emphasis is on minimalism and simplicity, making both the Y.1564 (EtherSAM) and RFC 6349 testing methodologies as straightforward as possible for all users. Only a small number of steps are required to set up, run and receive valid test results. One-page setup facilitates the setup and running of iSAM tests for field technicians of all skill levels. Cable test with power over Ethernet (PoE) Technicians can troubleshoot any cabling or installation issue by checking the cable’s actual pin-out, wire map, cable length, distance-to-fault measurement and propagation delay. Adding PoE means technicians can check for the following: presence of power, the power-supply equipment type, power class rating, voltage, current and power in watts. 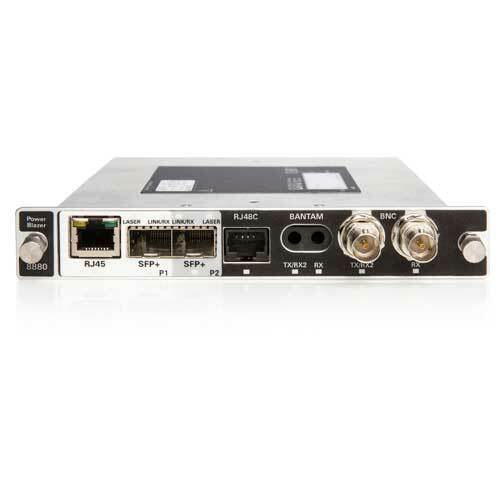 FTTA Testing The FTBx-8870/8800 CPRI protocol feature verifies that a remote radio head (RRH) is fully operational and that the correct small form-factor pluggable (SFP) transceivers are installed and properly connected. With the layer-2 CPRI protocol, technicians can easily connect to the RRH without having to climb the cell tower. Once connected to the RRH, the Power Blazer is able to supply the technician with a complete analysis of vital CPRI statistics. Traffic generation and monitoring Technicians can configure up to 32 streams of traffic in order to test just about any frame format including: Ethernet II, 802.3, SNAP, IPv4, IPv6, three levels of VLANs, MPLS, UDP and TCP. A new virtual frame display that allows field technicians to easily configure multiple streams and their parameters makes it possible to test layer-2 protocols, including: Cisco discover protocol (CDP), VLAN trunking protocol (VTP) and link-layer discovery protocols (LLDP) RFC 6349 service activation methodology RFC 6349 validates end-to end TCP services and helps correctly locate and diagnose issues as they arise. The RFC 6349 test helps resolve discrepancies between service-provider networks and customer premise equipment through: Maximum-transmission-unit (MTU) size discovery Baseline round-trip delay determination Single or multiple TCP connections to enable full pipe testing Carrier Ethernet operations, administration and maintenance (OAM) The FTBx-8870/8880 adds extra packet-capturing capabilities, including comprehensive filtering, triggering and truncation methods to target specific traffic and quickly pinpoint issues in the lab and in the field. Advanced traffic filtering using up to four fields and operands makes it possible to troubleshoot a particular traffic flow. Performance assessment of Fibre Channel services Since most storage area networks (SANs) cover large distances, and because Fibre Channel has stringent performance requirements, it is imperative to test each phase of network deployments to ensure appropriate service levels. In addition to full wire-speed traffic generation at the FC2 layer, the FTX-8870/8880 modules also support: Proper characterization of latency for FC services. Buffer-to-buffer credit estimation, a configuration parameter that estimates buffer credit values with respect to latency by calculating the distance according to round-trip latency times. Switch-fabric login capability to support connections to a remote location through a fabric or semitransparent network. Get ready to test your next-generation 100G network The growing demand for more bandwidth and the proliferation of data centers and inter-data-center connectivity is fueling the growth of 100G networks. 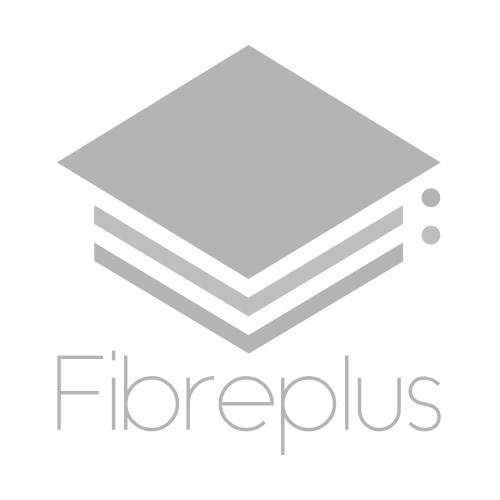 Network equipment manufacturers (NEMs) are responding with solutions that are better suited to the mass deployment of 100G in the network with the inclusion of high-speed pluggable CFP4 and QSFP28 interfaces that lower costs and offer increased port density. EXFO’s FTBx-88200NGE Power Blazer is the first test solution to offer integrated CFP4 and QSFP28 interfaces, making it ready for the 100G network evolution. Optical transport testing Complete OTN and SONET/SDH overhead manipulation and monitoring for advanced testing and troubleshooting. 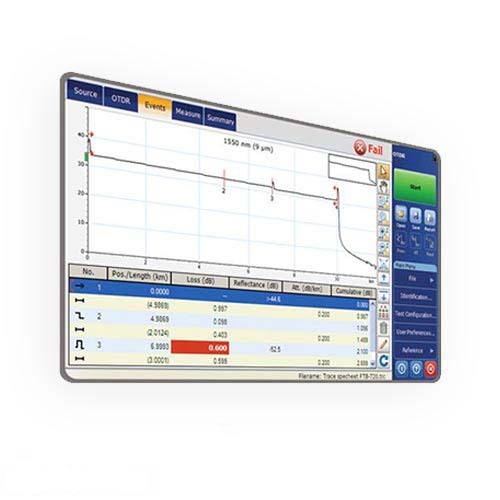 Advanced Multichannel OTN tool, which supports single-stage multiplexing from ODU0 to ODU4 with the support of 80 concurrent channels, including channelized service disruption measurement of all channels. ODUflex, which provides a future-proof solution to transporting any client signal at any rate. Ethernet and SONET/SDH mapping over OTU3/OTU4, enabling NEMs to qualify their 40G/100G transponder development (e.g., mapping and demapping capabilities), as well as client-signal timing transparency. Delay measurement for OTN, SONET/SDH and Ethernet traffic across all supported testing interfaces. Ethernet performance assessment Ethernet traffic generation and monitoring to simultaneously simulate and qualify different applications. EtherSAM, an ITU-T Y.1564 Ethernet service activation methodology that comprises a service configuration test and service performance test for comprehensive field testing of mobile backhaul and commercial services, as well as QoS validation for better troubleshooting. iSAM, an intelligent service activation methodology providing simplified ITU-T Y.1564 and RFC 6349 testing. RFC 6349 test methodology for validation of end-to-end TCP service, helping to correctly locate and diagnose issues as they arise. Rapid diagnostic test tools Per-wavelength laser control and power measurements to catch high power levels that could damage circuits or low power that may result in signal degradation. Per-lane frequency and offset measurements to determine network health prior to BER testing during 40G/100G network commissioning. IP connectivity tools, including a ping tool that verifies whether a user can reach a specific address within or outside of a subnetwork. 100G Through mode testing tool that sectionalizes traffic between networks and customer premises equipment by transparently monitoring Ethernet traffic between two endpoints. Advanced troubleshooting tools Packet capturing tool offering comprehensive filtering, triggering and truncation methods to target specific traffic and quickly pinpoint issues in either the lab or in the field. Advanced traffic filtering through up to four trigger fields and operands for troubleshooting of particular traffic flows. iOptics—Intelligent Pluggable Optics test application: this first-alert test can be used in the field or lab environment to efficiently evaluate proper operation of an optical device with minimal user configuration required. Push data to the cloud and get connected EXFO TFv—Test Function Virtualization, including FTB Anywhere floating licenses and FTB OnDemand time-based licenses to scale testing requirements to specific needs EXFO Connect to push and store test data content automatically in the cloud, streamlining test operations from the build-out to maintenance phases.